Lululemon Athletica inc. (NASDAQ:LULU) (TSE:LLL) struggled to respond to anticipated product quality issues and contain the fallout on social media, notes a recent Stanford University (Larcker, David F. and Larcker, Sarah M. and Tayan, Brian, Lululemon: A Sheer Debacle in Risk Management (June 17, 2014). In a research note dated June 17, 2014, authored by David Larcker, Sarah Larcker and Brian Tayan of Stanford, with the title: “Lululemon: A Sheer Debacle in Risk Management”, they point out that despite anticipating the risks, companies such as Lululemon are ill-prepared to manage them when they materialize. As reported earlier, Lululemon Athletica inc. (NASDAQ:LULU) (TSE:LLL) is still facing problems in attracting customers because of the major PR fiasco in 2013. According to the research note, the Canadian yoga pants retailer was cognizant of the risks facing its operations. For instance, in its form 10K filed previous year with the SEC, the retailer warned of its reliance on a limited number of suppliers. Moreover, the company also knew that the supply chain issues could disrupt its operations. For instance, it noted: “if defects in the manufacture of our products are not discovered until after such products are purchased by our guests, our guests could lose confidence in the technical attributes of our products and our results of operations could suffer and our business could be harmed”. Similarly the retailer also recognized the importance of its brand to its overall success, as well as the role that social media played in supporting the brand, when it remarked: “We rely on social media, as one of our marketing strategies….. Our brand could be adversely affected, if we fail to achieve these objectives or if our public image or reputation were to be tarnished by negative publicity”. However, the Stanford study points out that despite having identified these risks in advance, Lululemon Athletica inc. (NASDAQ:LULU) (TSE:LLL) struggled to respond to anticipated product quality issues and contain the fallout on social media. The study highlights a number of miscues such as Lululemon Athletica inc. (NASDAQ:LULU) (TSE:LLL)’s handling of the Luon recall, quality issues and related reputational damage. Providing specific instances, the study highlights that in recalling the pants, the retailer blamed its supplier for not meeting ‘technical specifications’, while the CEO Christine Day subsequently clarified that the problem was not due to production, but to inadequate testing. 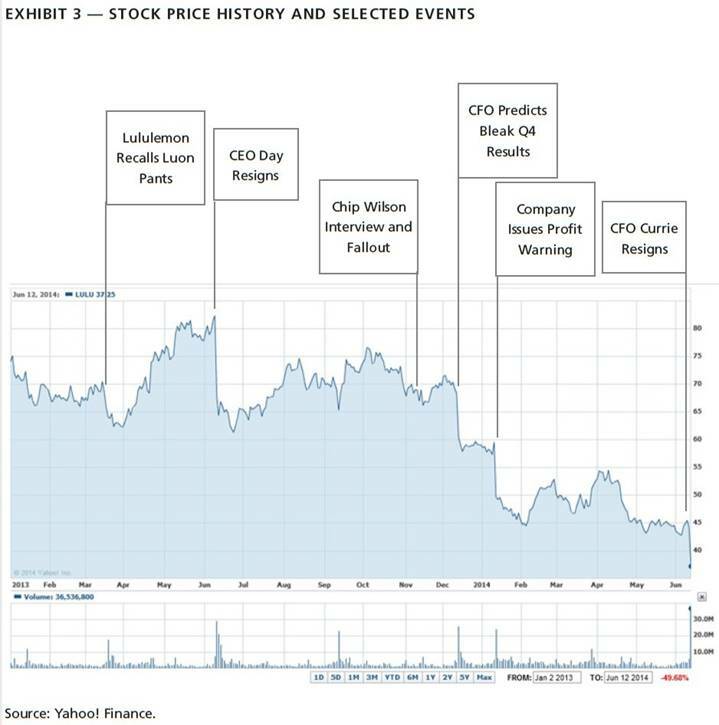 The study also wonders how the retailer’s Chairman Chip Wilson could sell $50 million in Lululemon Athletica inc. (NASDAQ:LULU) (TSE:LLL) stock through prearranged 10b5-1 trading plans just four days before Christine Day announced her resignation as CEO. Providing more insight into the poor handling of risks, the study notes the retailer’s chairman insensitively remarked in a television interview that the problem lay with customers rather than the product. The Stanford study also draws attention to the National Association of Corporate Directors (2014)’s observation that ‘risk’ ranks third on the list of topics that boards spend the most time discussing, after strategy and financial reporting. As a closing remark, the study poses a question as to how senior management and members of board of directors can make sure that a company has a reliable way to track and respond to strategic risks.